If there was a category of the most regular customers at Yum Yum Tree, my husband and I may very well fit into it. Located in our colony, this restaurant fanned our love for sushi with their unlimited sushi and beer offers on Tuesday nights. 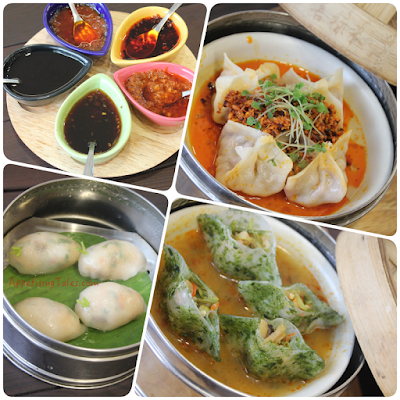 The immense popularity of this offer eventually included dimsums also, and was made available on Thursdays as well. The Sunday brunches were always very popular too and so was the rest of the food. Varun Tuli thus made an indelible mark in the F&B industry and his catering company Food Inc. does a fabulous job across all cuisines Indian, regional and of course international. Well, Yum Yum Tree closed down in my neighbourhood, but the goodness continues to spread across Delhi NCR. 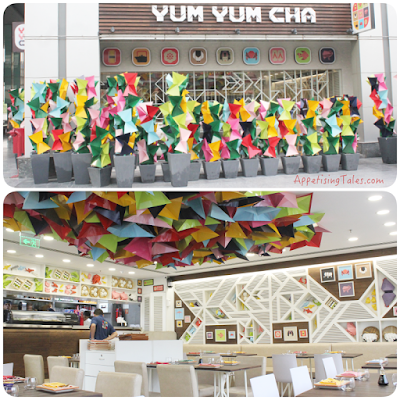 With the launch of Yum Yum Cha at Select CityWalk, Saket, not only did origami find its way into the décor but the crisp menu now included Sizzling Stone Bowls, Bubbling Hot Pots, a larger variety of sushi and dimsum, and the famous mochi icecreams. At the latest outlet at DLF Cyber Hub, the origami has bloomed into large flowerpots lining the entire length of the restaurant on one side. Besides adding colour to the largely white interior, origami flowers also conceal a little al fresco seating that will open when the weather permits. Inside, the theme is set around the sea with patterns and images of boats, fish and sea creatures. The kitchen is a happy sight – since it's not hidden behind a closed door, I can easily see that it is as large as the seating space. 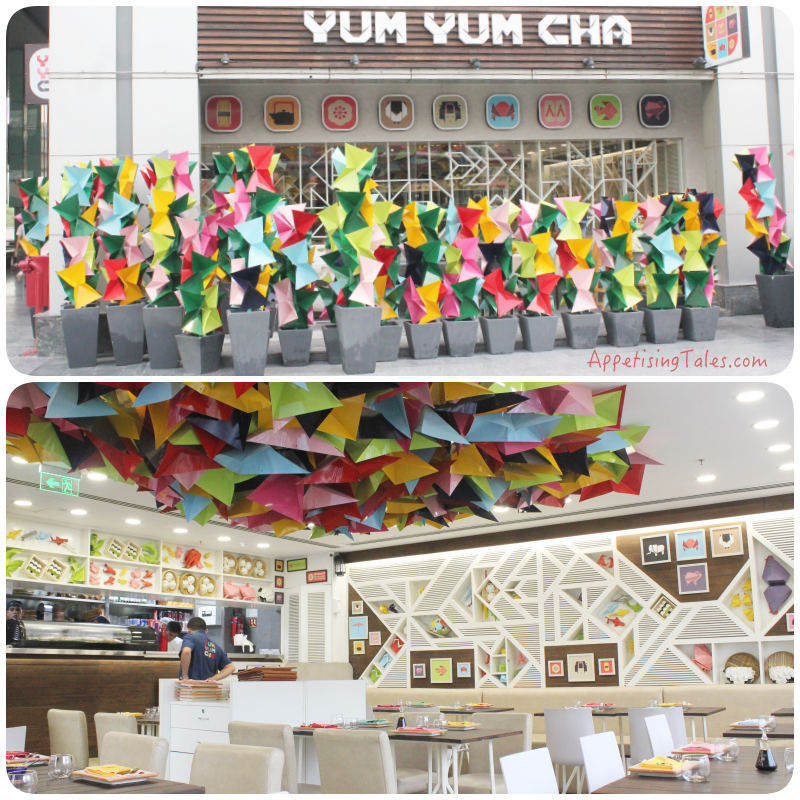 “We have always had large kitchen spaces,” shares Prathna Tuli, co-owner, Yum Yum Cha. Of the roughly 1200 square feet space, the kitchen takes up almost 600 square feet. conceal a little alfresco seating space. Since I am all too familiar with the menu here, I decide to go for most of the new additions along with a few favourites. The Chicken and Avocado Salad (Rs 385) is served in an avocado shell. Creamy avocado and chicken are tossed in yuso dressing, topped with garlic chips and microgreens. The salad oozes a freshness of ingredients that is so very important to the cuisine served here. 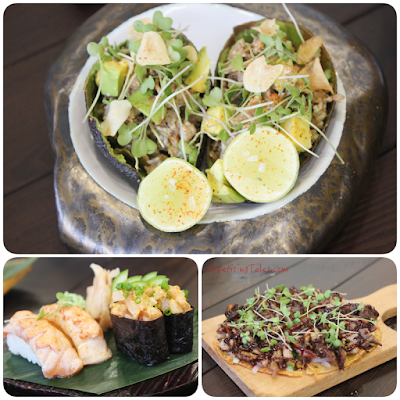 “The Japanese Pizza is our own version, with crisp tortillas forming the base for Asian toppings,” clarifies Prathna. While the options include tuna and truffle, and roasted peppers, we go for the Peking Duck Pizza (Rs 485). Topped with crispy duck, hoisin sauce and onions, it is a crunchy twist to duck pancakes. I prefer this version to the other pancake-like version of the Japanese pizza I’ve had elsewhere. 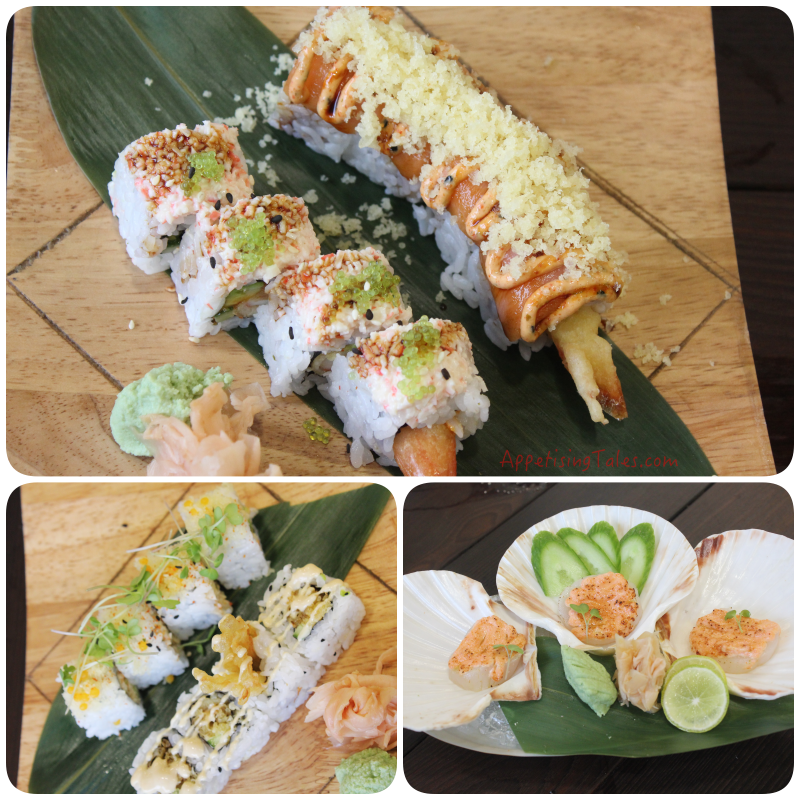 The wonderful new additions to the nigiri and maki are the Smoked Salmon and Yellowtail and Spicy Mayo, respectively (Rs 385 for 4 pieces). Even the tuna nigiri has a new twist with the addition of truffle oil. Both are a welcome change though puritans would prefer the regular salmon or tuna nigiri that continue to be available on the menu. Top: Chicken and Avocado Salad. Bottom L-R: Smoked Salmon Nigiri; Spicy Hamachi; Peking Duck Pizza. If you’re done with seeing food served in mason jars, you’ll appreciate how the jars are put to use here. Your pick of vegetables, prawns, rice, noodles, and chicken are presented in a mason jar, in which you add some mouthwatering spice mixes and actually shake the jar before you eat! Aptly called Shakes (Rs 285), the options like prawn & calamari, spicy chicken & seaweed, veggie salt & pepper work perfectly as crunchy nibbles to dig into with some cold beer on the side. There are some fabulous new vegetarian sushi and dimsum options. The Southern California roll (Rs 485 for 8 pieces) is inspired by the popularity of vegan fare in Southern California. It is made with Soya crab, avocado, micro greens, ginger, chilli and topped with a refreshing orange caviar. Then there’s the Enoki Tempura roll that has enoki mushroom tempura, cucumber and mayo that is drizzled with truffle oil. So yes, one sees a lot of truffle oil in the new menu. And although it is an acquired taste I feel that the palates of people in Delhi NCR are evolving enough to not only accept it but relish it. From the non-vegetarian options we go for Geisha (Rs 585 for 8 pieces) – crab salad, kimchi, prawn tempura and avocado, and the spicy Dynamite – salmon, spicy mayo, prawn tempura. The Scallop Sashimi (Rs 385 for 3 pieces), though served rather prettily, does not really work for me. The scallop could be sliced better and the spicy mayo on top really overpowers the flavour of the scallop itself. Bottom L-R: Southern California Roll; Enoki Tempura; Scallop Sashimi. Although the menu offers ample choice of curries in a paper hot pot, sticky rice and sizzling noodles, we decide to stick to some dimsum and end this delicious, satisfying meal. Hence come the Hot & Spicy Jade that Prathna describes as “salad in a dimsum” since the thin wrap encases snowpeas, beans, broccoli and pokchoy, and served in a flavourful spicy broth. These taste as beautiful as they look. The Prawn and Chive are a regular part of our order that we rarely miss, and the fantastic Chicken and Chilli Oil dimsums that come with a liberal helping of fried garlic. One can never really have enough of these “little bundles of joy” as the menu calls them. Spicy Jade; Prawn and Chive. While you can try the desserts that include a unique version of Bull’s Eye, Banofee Sushi and Espresso Crème Brulee, we go for the Blackberry Mochi Icecream. 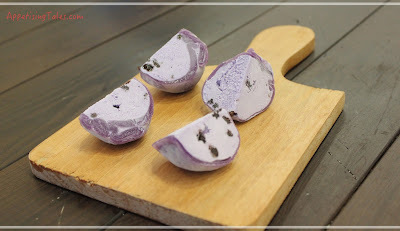 “Mochi is a traditional Japanese preparation made from steamed and pounded sticky rice and sugar.” Once the mochi shells are sliced open spoonfuls of smooth icecream in flavours such as mango, cappuccino, coconut and jaggery, vanilla, matcha green tea and rocky road are perfect to melt the summer away. Although the name Yum Yum Cha is a play on the Chinese "Yum Cha" that is typically a Chinese style tea and dimsum brunch, for me the key words are "yum yum" owing to the sheer deliciousness of an array of comfort food. And FYI, the new additions from the Cyber Hub menu are already being made available at the Saket outlet too. Yum Yum Cha, Cyber Hub Building No.10, Gurgaon. Timings: 12 Noon to 11pm.